Groenewegen crosses the line on Saturday. 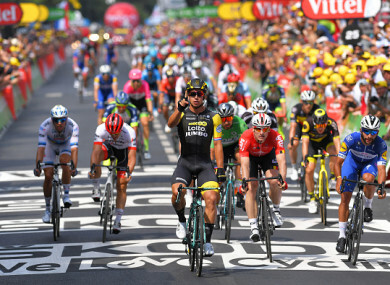 DUTCH ACE DYLAN Groenewegen sprinted to a second straight win on stage eight of the Tour de France on Saturday as second and third Andre Greipel and Fernando Gaviria were disqualified for elbowing and headbutting at 70km/h. Fourth-placed Peter Sagan inherited second with fifth-placed John Degenkolb promoted to third after a thrilling but rough and tumble sprint. Overall leader Greg Van Avermaet of BMC held on to the yellow jersey for a sixth day but after a mass fall held up around half the peloton 17km from the line. Ireland’s Dan Martin trailed home 1min 16sec off the winner bleeding at the elbow and with his Tour hopes severely dented. “I’m going to try and ride tomorrow but obviously it’s going to be very sore,” said Martin at his UAE Team Emirates bus. “When the doctor took off the bandage he went oooh! When you hear a doctor say that you know it’s no good,” he said. Quick Step’s Julian Alaphilippe, who started the day in fourth overall was also caught in the fall and appeared to be in severe discomfort in his saddle. Most of the other leading contenders, including Chris Froome, Romain Bardet, Vincenzo Nibali, Nairo Quintana and Richie Porte came home safely in the peloton. The 25-year-old Groenewegen, who rides for the Dutch Lotto team, flew out of the pack on France’s July 14 national holiday to leave Greipel, Gaviria and Sagan trailing in his wake. He made his move at the very last moment and showing for a second time that he has refound his form and above all his confidence. “I didn’t see what happened behind me and can’t comment on the decision,” said the Dutch rider who also won Friday’s seventh stage to join Sagan and Gaviria with two wins each from the first eight days’ racing. “I was watching everything and I just waited for my chance,” said the stocky Amsterdam native who on Friday put a finger to his lips to silence his detractors at the line but on Saturday put up two fingers, which he said was for two, and for peace. World road race champion Sagan extended his lead on the green jersey points race and was as relaxed as ever. “I started early, because everyone was there, I’m there every day so maybe that is why I didn’t quite have the strength for the finish,” explained Sagan. “Tomorrow I’ll try again, it’ll be a hard day for all of us, but it’s just 150km, just three and a half hours,” he said keeping a straight face. “Greg (Van Avermaet) and the classic guys will be there, maybe around 50 of us,” he said. Latvia’s Toms Skujins of Trek-Segafredo kept hold of the polka dot King of the Mountains jersey. Email “Dan Martin suffers crash as Dutch ace Groenewegen makes it back-to-back stage wins”. Feedback on “Dan Martin suffers crash as Dutch ace Groenewegen makes it back-to-back stage wins”.